Von Triers graduation film is the work of a young director with a vision and a firm grip of his medium. Even though every other scene (or individual shot for that matter) has been lifted from Tarkovsky‘s films or Bertolucci‘s “The Conformist” the film has a gripping mood and qualities that cannot be ignored – the lesson of this must be: if you steal, steal from the best. Von Trier would later develop this style into his fascinating and original “Europa”, before he with “Breaking the Waves” abandoned all this for Cassavettes style hand held camera and more conventional, naturalistic performances. A pity. “Lars Von Trier’s Europe Trilogy” by Noel Megahey, UK, on The Digital Fix. This is a thorough review of the Region 2 (non-USA) DVD set released in 2005. Images of a Relief is one of the many special features in the box set, including Nocturne , an 8-minute short from 1980. There is also a 2005 interview in the set where Lars makes a few comments about the film ( A Conversation with Lars von Trier , 45min), currently available on YouTube. Another hidden feature, Lars von Trier’s graduation film can be found behind the Alka-Seltzer in the Special Features menu. 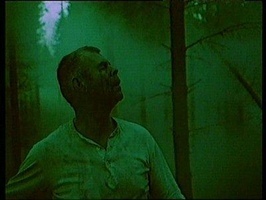 Images of a Relief (52:06) is made again with Tómas Gislason and Tom Elling, and bears all the hallmarks of Element of Crime and Europa, again heavily influenced by Tarkovsky and some of the elements reminding me of Bertolucci‘s The Conformist. The story – seeming to be based around the sufferings of a group of suicidal German troops at the hands of partisans at the end of the war, is almost incoherent. The picture quality here however is rather too murky for the chiaroscuro lighting. Still, it’s a very nice extra to complete a comprehensive package of Lars von Trier’s early work. this is von trier’s graduation film. the style of his very early work, no matter how overtly inspired, is, to me, a thing of extreme beauty and substance. the way he works with darkness, single colours, and intangible shapes, makes me want to break down. the film’s story is political and personal. the accompanying images are immediately haunting. i do not know where this side of von trier is now. i adore what he is doing now, but it is incredible to me that he seems to have been able to separate himself from whatever caused him to make this. No reviews on Rotten Tomatoes. Limited information on Wikipedia. There is a review in Danish at Philm. Directed by Lars von Trier. Written by von Trier and Tom Elling, a film school collaborator who was also the director of photography for The Element of Crime. Edward Fleming (German officer Leo Mendel) and Kirsten Olesen (his mistress Esther) were the only professional actors in the film. More credits on IMDb. 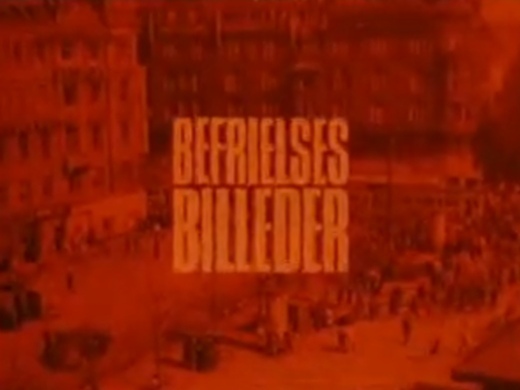 According to the Danish Film Institute, this was the first Danish student film to reach wide release. That link also has a gallery of 16 Befrielsesbilleder production stills (see purple-tinted photo below). * In fact, most of this renowned Danish director’s films before Dogville are very difficult to purchase in America. Some may be found on YouTube from time to time, but the video quality is usually horrendous. Tartan really needs to release the Europa trilogy DVD set (mentioned above) to Region 1.